In A Different Pond, author, Bao Phi, and illustrator, Thi Bui, both Vietnamese Americans, create a necessary and impactful story that is both a tribute to their working-class new immigrant childhoods and a valuable #OwnVoices contribution to children’s literature. The story is anchored in a purposeful fishing trip a father and son take to secure food for the family. Rich colors and a creative use of panels provide intimate portraits of the duo. This accessible first-person narrative, told from the child’s perspective, unfurls like an intimate memory. The story engages myriad social themes gently, enveloping them in the primary story of a father and son’s unique bond. But that doesn’t mean they are buried. Issues of war and death, poverty and hunger, immigration and xenophobia, are presented with sophistication and dignity. The challenge of feeding one’s family is subtly explored when father and son stop at a bait store to purchase minnow and the “bait man,” himself at work in the middle of the night, asks why they are out. The father explains that he has begun working a second job on weekends and must catch fish for the family’s meal before he goes to work. In another instance, the boy-narrator describes his father’s hands as callused. Father and son share a quiet intimacy gorgeously portrayed by Thi Bui. In one image they are represented facing the lake, father has one hand on a fishing pole and another on his son’s back, sweetly portraying their relationship. When they arrive home the rest of the family is awake. The boy and his mother clean the fish before his parents must go to work, leaving the young boy in the care of his older siblings. As the child sits on his couch waving good-bye to his father, who rides off to work on a bicycle, he shares that he is sad, but not too sad. Then he imagines the dinner his large family will share and is proud of his contribution. Socially relevant, artistic, and lyrical, this book belongs on everyone’s bookshelf. A Different Pond is a story that needs to be told and both writer and illustrator render it with specificity and depth. This is an immigrant story like none I have read before and I am so glad books like this are available for young people. (I am not the only one raving about it. 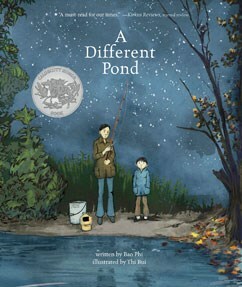 A Different Pond is a 2018 Caldecott Honor Book).